How does one change their diet from the overcooked, sugar and free radical filled modern American diet to a healthier food plan? To tell the truth, there are many ways to achieve optimal health through an improved diet, but all of them require food that people will actually eat. One such way to eat your way to better health would be to read and apply the recipes in How to Lower Your Cholesterol with French Gourmet Food by Chef Alain Braux. Braux, a real-life French chef transplanted to Texas, answered a question about how to use French cooking techniques to eat properly starting a journey back to the foods of his native southern France, a variation of the Mediterranean Diet. This diet consists of more fish, vegetables and gently cooked meats in sauces made from wholesome ingredients. Whether you call it the Mediterranean Diet, the Atkins Diet or even my own Food Plan Three, we favor this kind of eating. Sugar and the other diet red flags cause raised cholesterol mostly in the form of low-density lipoproteins (LDL) and lowering high-density lipoproteins (HDL). Whole food diets like the Mediterranean Diet fight cholesterol because the original human diet had ten times the fiber, more whole foods and next to no sugar. Cholesterol, heart disease, diabetes have followed. Of the nearly hundred pages devoted to recipes, most follow precepts with which we agree: more organic fruits, vegetables and locally derived grass-fed meat. Frankly, the recipes seem so delicious that we regret not having enough time before going to press to try any of the dishes. In our defense, neither one of us has the Dutch oven required for a good percentage of the meals. Still, if we were any better at cooking ourselves this is the cookbook we would write. Of course, despite many interesting uses for fish, venison, other meats and just about every vegetable available in France or Texas, Braux is still a French-trained chef likely to run home to Mama with an amazing pastry. Pastries and some kind of sweetener always go hand in hand as the sugar, honey or high fructose corn syrup feeds the yeast that makes bread rise. For people who are moderately healthy there can be a little bit of indulgence, but other people just can’t have any sugar at all. At least the plan allows for that treats are just that, rare things that spice up life. Another quibble that we have with Chef Braux’s program is his assumption that a few of the sweeteners listed in his book are better for people in moderation. We have already commented on agave as a sugar substitute, which Chef Braux has used in some of his desert recipes. Our position is that agave is primarily fructose and isn’t quite as healthy as advertised. 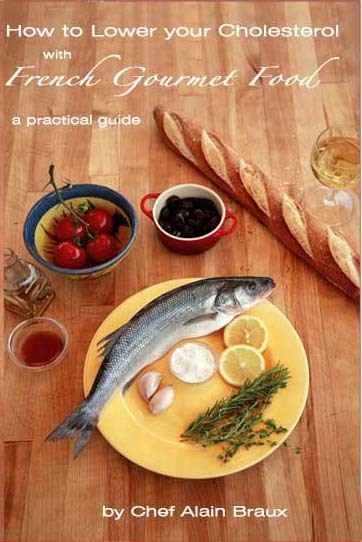 As a book, How to Lower Your Cholesterol with French Gourmet Food presents the information in a fairly clear manner using both the French and English terms for each dish. We did find some typos indicative of a self-published book written by a non-native speaker. But, the program is golden and actually has a chance of keeping people eating well. Chef Braux speaks with great authority as he applied these recipes to his own diagnosis of high cholesterol. He is glad to report that his blood test shows a return to good health all without resorting to statins or other medical interventions. We can’t recommend this book highly enough. Please follow the links below to learn more about Chef Braux and his healthy recipes.